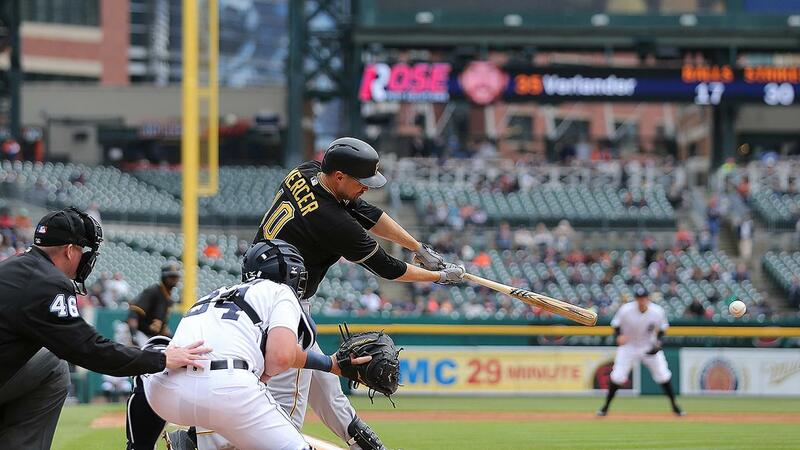 The Pirates roughed up Justin Verlander for seven runs on 10 hits over 4 1/3 innings, then withstood a Tigers rally in the later innings for a 7-4 win Monday afternoon at Comerica Park. Not since Verlander's 2008 season had he thrown 100 pitches without getting through the fifth inning. The Pirates made him labor through 111 pitches, including 25 foul balls that extended at-bats and forced Verlander to go back to secondary pitches that weren't working Monday. John Jaso, Matt Joyce and Josh Harrison hit leadoff doubles and scored in the first, third and fourth innings, respectively, while Gregory Polanco hit a one-out double and scored on Jordy Mercer's two-out single in the second. Nick Castellanos and J.D. Martinez hit their first home runs of the season, both solo shots, in an effort to lead the Tigers back, but Detroit couldn't find a big inning against Pittsburgh starter Jonathon Niese. Mercer extends lead: In the second inning, Mercer fouled off five of his first six pitches from Verlander before hitting an 0-2 slider back up the middle to drive in two runs and extend the Pirates lead to 3-0. Jaso makes Verlander work: Although plenty of Pirates had good looks at Verlander, shrugging off his offspeed pitches while sitting on his fastball, arguably none did so better than Jaso. He fouled off five Verlander pitches, including the curveball, to stay alive in an 0-2 hole before lofting a full-count offering to center field for a key sacrifice fly in the fourth. Long inning, quick ending: The Tigers brought the potential tying run to the plate in back-to-back at-bats with one out in the sixth inning against Niese, who struggled falling behind hitters in his sixth and final inning, but Detroit hurt itself with a pair of first-pitch outs. Martinez hit into what was initially ruled an inning-ending double play, but replay review showed third baseman Sean Rodriguez missed the tag on Miguel Cabrera, keeping the threat alive. Castellanos hit Niese's next and final pitch to center field to render the ruling moot. Double play all but ends it: The Tigers got the game-tying run on deck in the ninth, with one runner on and no outs, but Castellanos lined out to third base, and David Freese quickly threw across to first base to double-off Martinez. Verlander's outing was just the 13th time in franchise history a pitcher has thrown 110 or more pitches without getting through five full innings. Verlander became the second Tigers pitcher to do it twice, having thrown 110 pitches over four-plus innings against the White Sox on July 26, 2008. C.J. Nitkowski is the other Tiger to hit the inefficient milestone twice, doing so on July 13 and 23, 1996. The initial ruling on Martinez's grounder in the sixth inning was that Rodriguez tagged out Cabrera before firing to Harrison at second for the forceout. Had the Pirates followed through on the play, they had an out at first as well. Instead, the Tigers were able to challenge the call on Cabrera, and replay showed Rodriguez didn't touch him, keeping the inning alive (briefly). Pirates: Juan Nicasio will take the mound for the final game in Detroit at 12:10 p.m. CT. Nicasio allowed one run and two hits over six innings in his first start this season. It's the first appearance against the Tigers in his career. Tigers: Anibal Sanchez faces the Pirates Tuesday afternoon at Comerica Park trying to avenge their meeting last year in Pittsburgh, where he gave up three home runs. Sanchez picked up a win in his first start last Wednesday at Miami, where he took a shutout into the sixth before giving up two runs.